What’s better than a mobile social discovery app that allows you to find out interesting places in your ‘hood, or the group chat function of messaging services such as WhatsApp? How about a location-aware mobile social network that combines both functions and lets you chat with people in your surrounding locale? 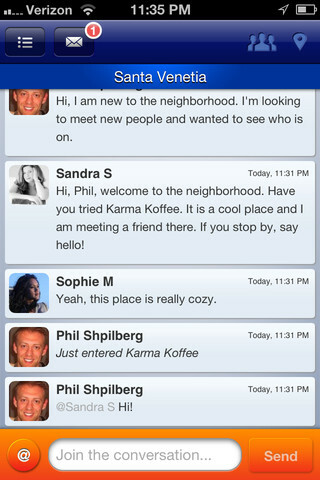 San Rafael, California-based City Chatter (www.citychatter.com) has launched its mobile application – available on iOS and Android – that combines social discovery, real-time group chat, and private chats to enable interaction with people around you. The idea is dastardly simple. All you need to do is to check into a certain location, and you can find other users around you in the same neighborhood looking to chat. You can join group chats to discuss certain topics – for example, if you’re a delegate at a business convention and discussing a certain topic – or use one-on-one chats to, well, potentially hook up with that lonely single at the bar. “I instant message or text people sitting right next to me all the time. I would rather chat with people on my phone before I talk to them in person, if I ever even talk to them in person,” says City Chatter founder Phil Shpilberg, who has led multiple successful entertainment and technology launches for companies including major game publisher 2K Games. “I wanted to create that Facebook/LinkedIn/IM experience in real-time, with the people who around me now. The current social discovery apps don’t do it for me, because I want to do what’s natural… talk to people,” he adds. City Chatter is available for free at the iTunes App Store and on Google Play.